Apply now to reserve your place in Jerusalem, Israel. PROGRAM COST: $4,995 + airfare (Includes: Tuition – 3 credits, housing, instruction, health insurance, farewell dinner and special programs, activities and cultural events). Jerusalem is one of the oldest cities in the world, settled more than 5,000 years ago, according to Ancient History Encyclopedia. The city is holy to three of the world’s major religions: Judaism, Christianity and Islam. Jerusalem is a crossroads between East and West, and it’s a place where people from various cultural and ethnic backgrounds interact, intersect and sometimes collide. 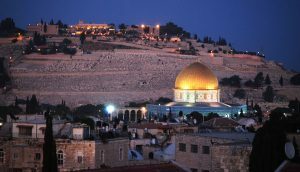 As a focal point of the Israeli-Palestinian conflict, Jerusalem is also a major center for reporting on the Middle East, and many international news organizations maintain bureaus here. Students will learn international reporting techniques from veteran journalists and then work as foreign correspondents themselves, publishing their work on a multimedia website. Jerusalem is a holy place for three world religions. “It is an incredible opportunity to work as a journalist. You investigate an issue, work with a local fixer, interview locals, talk with experts and officials, and are mentored by journalists who are actively working in the field. If you want to be a journalist, this is your chance.” – Patrick Torphy, Emerson College, 2014 ieiMedia-Jerusalem participant. International Reporting – Students will learn how to develop sources, conduct interviews and work with an interpreter, then report on the city around them, publishing their work on a professional-quality website. Teaching the course will be a team of veteran journalists who have covered the Middle East for years. Our faculty includes Ilene Prusher, a former foreign correspondent with extensive experience covering the Israeli-Palestinian conflict as well as Iraq and Afghanistan; Linda Gradstein, a longtime National Public Radio correspondent in Jerusalem; and Ricki Rosen, a news and feature photographer whose photos have appeared in Time magazine and The New York Times in her more than 25 years in the region. 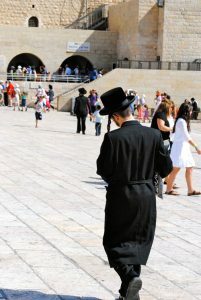 People from around the world come to visit the Western Wall. Jerusalem is one of the most fascinating cities in the world, mixing ancient and modern, holy and secular. Walk the stone streets of the Old City or the lively thoroughfares of modern Jerusalem and you’ll witness the diversity of the human experience. 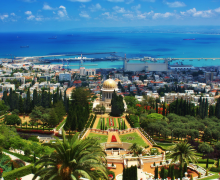 The capital of Israel, Jerusalem enjoys not just an abundant collection of historical and holy sites but also museums, theaters, restaurants, cafes and lively arts venues – as well as Israel’s parliament, the Knesset. East Jerusalem, which Israel annexed following the 1967 war, is what Palestinians view as the capital of their future state. Students will have opportunities to visit various parts of the city, meet community leaders and conduct interviews that will shed light on Jerusalem’s complexity and its place at the heart of the conflict. Students will live and learn at Hebrew University of Jerusalem, a modern campus on Mount Scopus. Hebrew University of Jerusalem was founded in 1925, two decades before the founding of the state of Israel, and it currently has about 23,000 students. 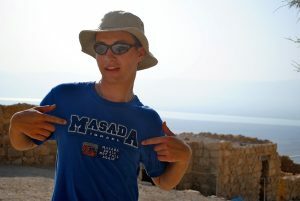 During the summer, students from around the world come here to study Hebrew and Arabic language, archaeology, Middle East Studies, Jewish Studies and Islamic Studies. ieiMedia students will have the opportunity to mingle with Israeli and international students. 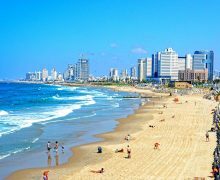 Students will have two-day weekends (Fridays and Saturdays) and one three-day weekend (Friday-Sunday) to explore the city or to travel around Israel. Cities such as Tel Aviv, Haifa, Nazareth and Bethlehem are all accessible by bus. Those who want to tour extensively should plan travel time before or after the program. 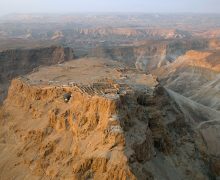 Students will visit the ruins of ancient Masada. The program is open to English-speaking college students and recent graduates from any university. Over the past decade, participants in ieiMedia programs have included more than 800 students from 80 U.S. and Canadian campuses, along with students from Japan, Peru, Singapore, Thailand, Trinidad, Turkey and the United Kingdom. Most of our students are journalism or communications majors, but those majoring in other subjects are welcome as well. For non-journalism or communication majors, experience working for a college or professional publication is helpful but not necessary. The program is open to graduate students. We’d be happy to confer about supervising an independent project that would qualify for graduate credit at your school — or to offer this experience as a graduate internship. 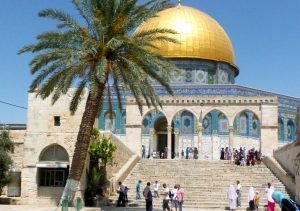 The Dome of the Rock, or Haram ash Sharif, is one of many holy shrines in Jerusalem. Ilene Prusher is a journalism instructor at Florida Atlantic University, where she is also a faculty fellow in the Peace, Justice and Human Rights Initiative. She is an award-winning journalist and author who worked as a foreign correspondent for 20 years, covering Middle East, Asia and Africa. She served as a staff writer and bureau chief of the Christian Science Monitor from 2000-2010, and has also been a frequent contributor to TIME, The New York Times Book Review, The Guardian, Haaretz, The Jerusalem Report and other publications. She has taught at NYU-Tel Aviv, the Hebrew University, and IDC Herzliya and is the author of Baghdad Fixer, a novel about the war in Iraq. Linda Gradstein teaches journalism at Hebrew University and NYU-Tel Aviv. She is also a freelance reporter for diverse outlets, including Voice of America, CBS Radio, Hadassah Magazine and the Jerusalem Report. For 20 years, she was the National Public Radio correspondent based in Jerusalem, and she won several awards for her coverage, including the Overseas Press Club Award. Rachele Kanigel is a professor of journalism at San Francisco State University, where she advises Golden Gate Xpress, the student newspaper, and teaches reporting, magazine, international journalism and media entrepreneurship classes. She was reporter for 15 years for daily newspapers, including the Oakland Tribune and The News & Observer, and was a freelance correspondent for Time magazine. Ricki Rosen is a news photographer and videographer who has worked professionally for more than 25 years. She was a contract photographer for Time magazine, and her work has been published in all major international publications including Newsweek, The New York Times Magazine, People, Paris Match and Figaro. Rosen, who lives in Jerusalem with her two children, also shoots and edits video documentaries. View complete faculty biographies on our Jerusalem Faculty Page. Students will live in modern dorms on Hebrew University’s Mt. Scopus campus. 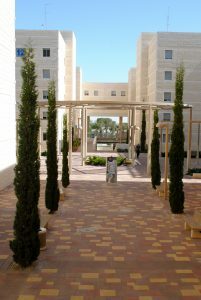 Students will live in modern dorms on Hebrew University’s Mount Scopus campus, a short walk from university classrooms and a short cab, light rail or bus ride from the city center. Students typically live in single rooms within five-person suites. Each bedroom contains a bed, desk, chair and closet. Suitemates share bathrooms and a full kitchen, where participants can prepare their own meals. Moderately priced snack bars and sandwich counters, as well as a small supermarket, are in or near the student housing complex. Self-service automatic washing machines and dryers are located in each dormitory complex. Students are expected to bring a laptop computer and digital camera, cell phone or other device that can record audio and video. Most people in Israel speak at least some English. Interpreters will be available for students who want to interview Arabic or Hebrew speakers. American citizens are entitled to $750 scholarships available through the Rothberg International Schools Office of Academic Affairs. Additional needs-based scholarship funding is available through the American Friends of Hebrew University. Jerusalem has holy sites for three major religions– Judaism, Christianity and Islam. 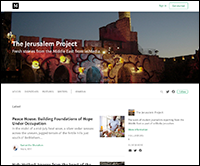 Check out the work created by students in the 2017 Jerusalem Project at http://medium.com/the-jerusalem-project. 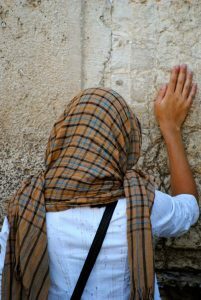 Apply now to reserve your place in the Jerusalem, Israel, program. Or, contact Program Director Ilene Prusher at: ilene.prusher@ieimedia.com. Students must fill out the online application and include contact information for two references using the “Apply Now” link. A $100 application fee is required with the application but will be applied in full to your program fees or refunded if you are not accepted into the program. Application deadline: March 1, 2019.